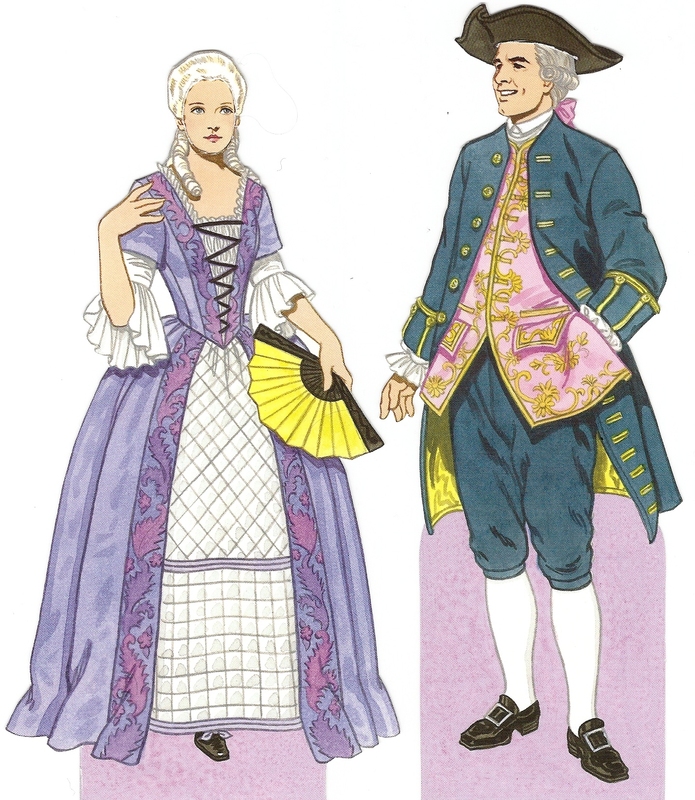 These lovely paper dolls by Tom Tierney show the fashions of the middle/merchant class of the Baroque and Rococo periods. Styles worn by the nobles and royalty were similar in structure, but much more extravagant and exaggerated. c. 1650 The woman wears a high-waisted dress with a falling, wide lace collar and turned-back lace cuffs common during the early Baroque era. The man wears a cavalier-style outfit with a high-waisted jacket, wide lace collar, lace cuffs, and high boots. Decorative canes became very popular during this period and many men would carry them around as an accessory. 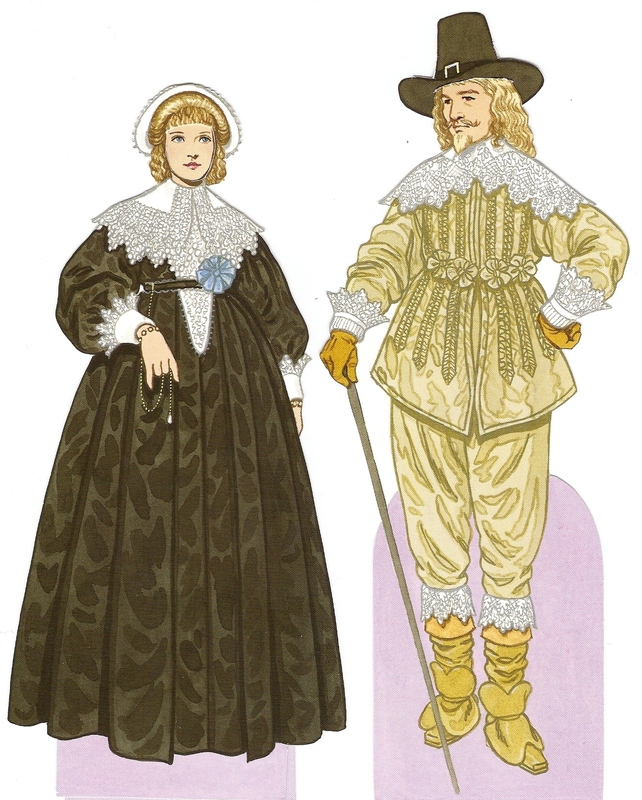 c. 1660 The woman on the left wears the German fashions of the period, with puffed sleeves, a small hooped skirt, and a fur hat. The woman on the right is dressed in the Scandinavian style, with a brocade palatine or capelet over her shoulders and a white cap. 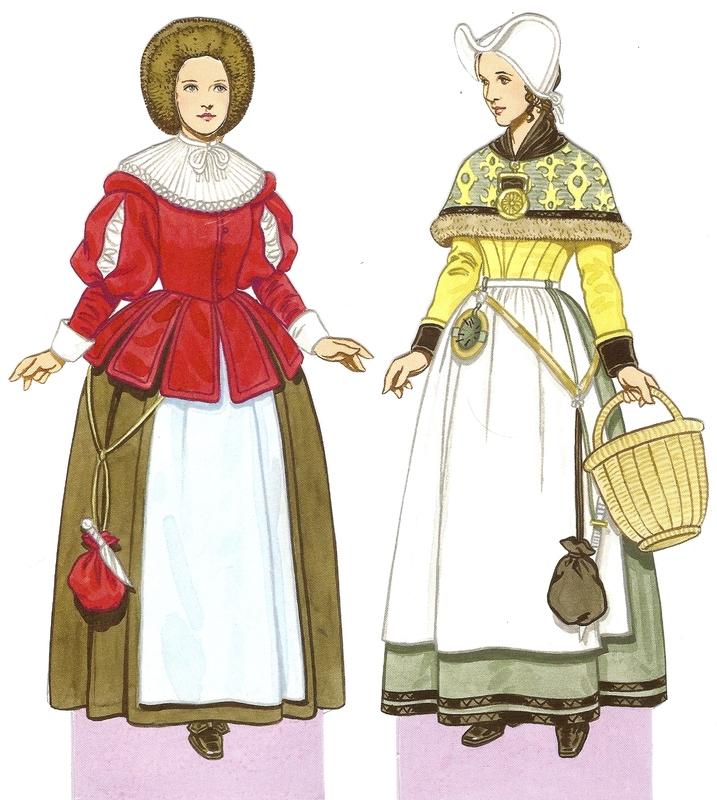 Both women wear decorative aprons and a “housewife” hanging from their waists. c. 1670 The woman wears a wide collar trimmed with ermine fur, a muff, a hood, and a velvet mask to keep out the cold. Her underskirt is trimmed with gold embroidery and her bodice and sleeves are trimmed with ribbons. The man wears a long coat, breeches with hose underneath, and a wide-brimmed hat with feathers on it. He also carries a cane. 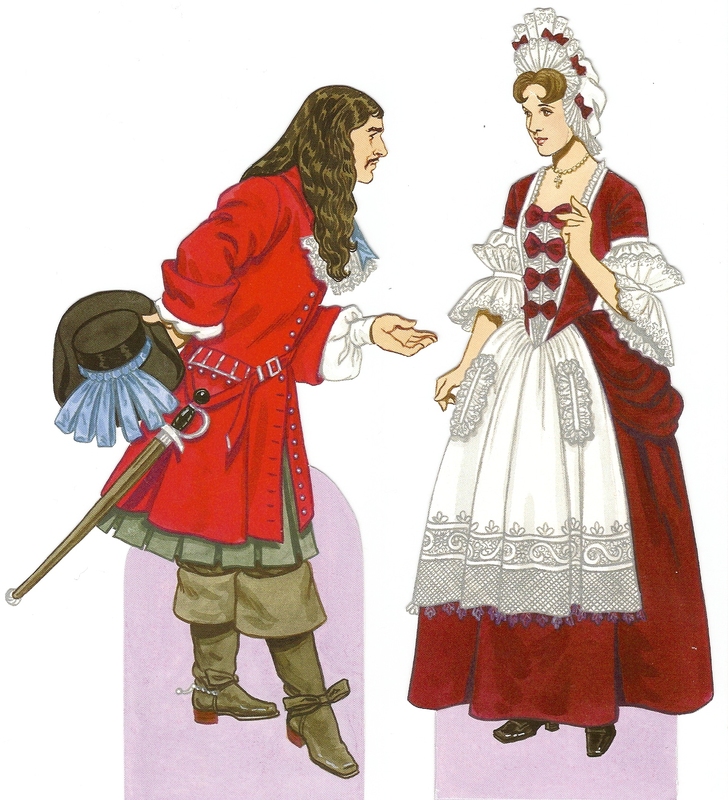 c. 1690 The man wears Rhinegrave breeches under a long, buttoned coat, a lace jabot, and large boots. His hair is worn long and free in the style of Louis XIV. The woman wears a high fontage headdress and the stiff stomacher that returned to fashion in the latter part of the Baroque period. Her decorative apron, headdress, and sleeves are all lavishly trimmed with lace. c. 1720 This period was a transition from Baroque to Rococo fashions, and so incorporated styles from both eras. The man wears a long coat buttons at the middle, knee breeches, hose, and buckled shoes. His sleeves are loose and cuffed, showing the undershirt underneath. The woman wears a flowered robe à l’anglais with large cuffs and a lace collar. c. 1730 Both women wear a robe à la française in the “Watteau” or “flying” style, in which the back hung loose from the bodice. Small panniers are worn, but only aristocratic women and royalty wore the ridiculously wide panniers. The woman on the right’s bodice is adorned with ribbon bows down the front and has large cuffed sleeves. The woman on the left wears a lace cap common during the period. 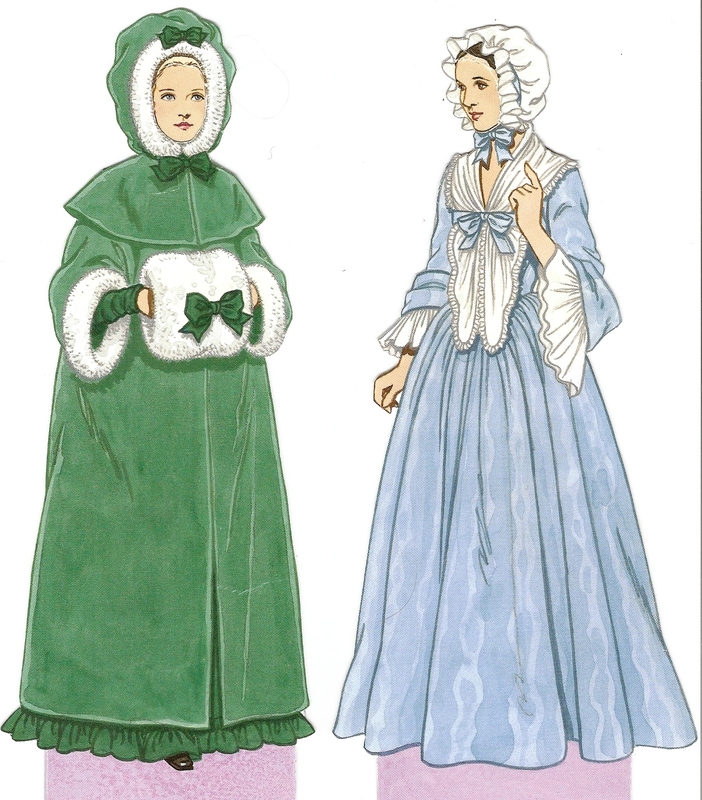 c. 1750 The woman on the left wears a hooded capuchin cape trimmed with fur and ribbons. 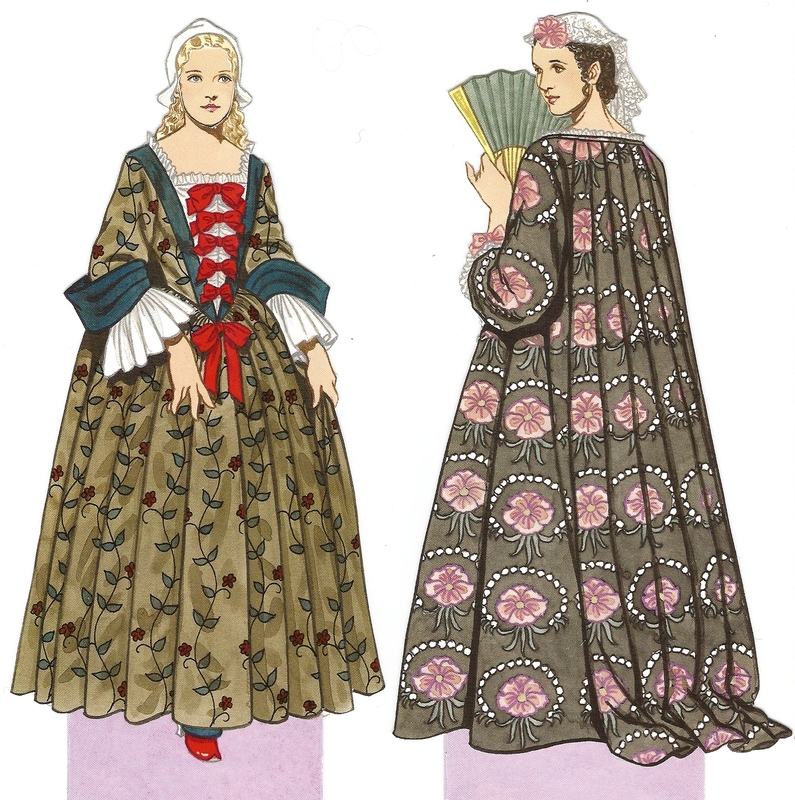 The woman on the right wears a gown with large cuffed sleeves and a fichu around the neck and shoulders. She also wears a mobcap tied under the chin with a ribbon. c. 1770 The woman wears a solid colored gown with embroidery at the opening of the overskirt and bodice. A quilted underskirt is worn underneath. She also has sleeves flared at the elbow and wears her hair powdered and curled, common during the last part of the Rococo era. 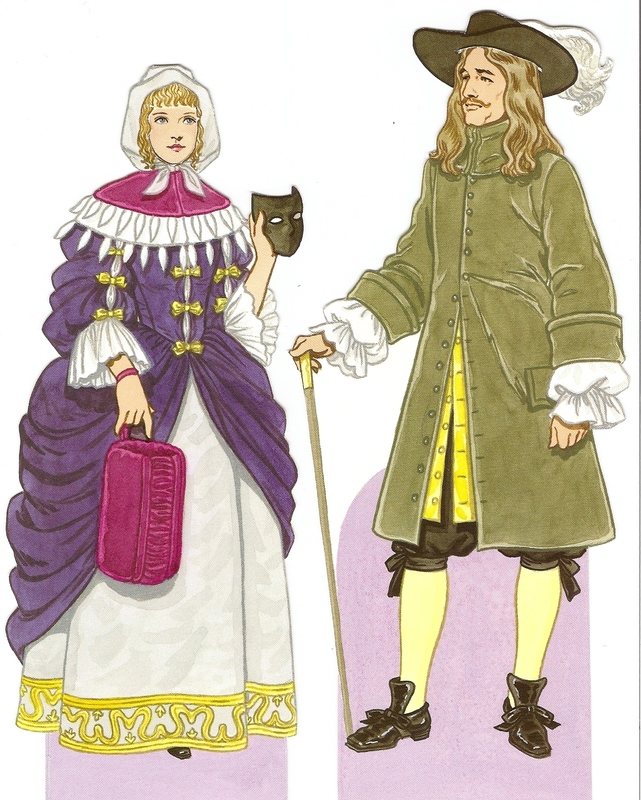 The man wears a brocade silk vest under a long coat lined with silk with large buttonholes down the side, as well as a tricorn hat and buckled shoes. His hair is also powdered and is tied back with a ribbon. I had these paper dolls growing up! My mom visited an aunt or someone in Virginia and got them for me in Colonial Williamsburg. Too funny. I remember begin just old enough not to want to cut them out and actually play with them. Instead I was making dresses for my dolls using the pictures as patterns for trim and shape. Nerd! 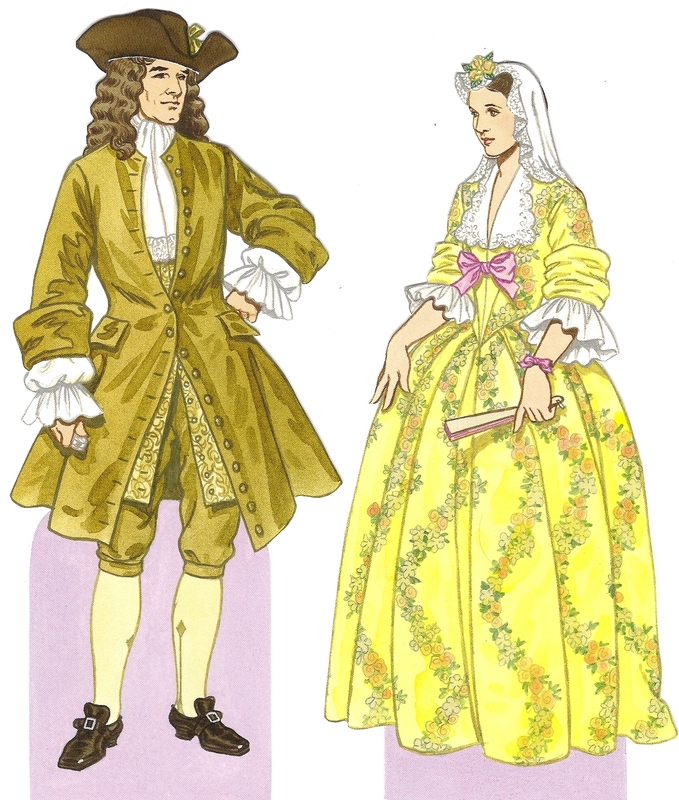 The yellow pair in Plate 5 make a pretty couple. I’m partial to mid to late 18th century, but starting in the 1720s and onward, you really get to see the transition in men from skirted frock coats to the straighter coats that eventually shrunk waist high in the Regency. Very nice! I’ll have to check out Tom Tiernay. I somehow never had paper dolls as a girl.